The quartet of young English batsmen that caused such a stir when they arrived on the scene in the late 1980s included one cocky Essex boy who came to county cricket, and then the England set-up, from birth in Chennai by way of Durham University. Those of us who have followed England’s ups and downs – and what spectacular downs they have been – over the course of a lifetime will occasionally have been given cause for unbridled joy and optimism. So it was when Michael Atherton, Graham Thorpe, Mark Ramprakash and Nasser Hussain made their bows. From studious Cambridge historian, chirpy Farnham left-hander, truculent prodigy from Bushey and Indian-born leadership hopeful, they dominated English batsmanship from the end of the Gooch era to the beginning of the Vaughan and Pietersen days. That Essex boy, Nasser Hussain, who achieved so much, yet had to work much harder than some of his more gifted contemporaries,almost failed to make it at the highest level. For until 1996, when he was 28, his Test match career was sadly stuck in neutral. “Nashwan” or “Nass” was first called up for Test match duty on England’s 1989/90 tour of West Indies. In the March of 1990 on that tour, he would enjoy his 22nd birthday. Despite the eventual 2-1 series defeat, the series is a fondly remembered one. Under his county team-mate Graham Gooch’s captaincy, Nassar played three Tests without ever really establishing himself. With the West Indians operating with a fiery line-up of Ambrose, Bishop, Ezra Mosely and Walsh for the most part, Malcolm Marshall, then 32, also reappeared for two Tests, interrupted by injury. Though Hussain only managed an average of 20 in his three Tests, his tigerish qualities were evident, especially in the dramatic fifth Test in Antigua. Contributing 35 and 34 in low England totals, it was later revealed by the England management that he had broken a bone in his wrist. Returning home for the twin series summer against India and New Zealand, the young Essex right-hander must have thought that he done his chances of a middle order berth no harm at all. Little did he realise it but Hussain would not turn out for England again until the Ashes summer of 1993, when Allan Border made his final tour of England. Hussain had moved to England and settled in Ilford, Essex, when he left the land of his birth in 1975. A son of Chennai, his father, Raza Jawad “Joe” Hussain, and his English mother landed in England in order to enhance the education of their three sons. Although their life in India had been, by Hussain’s own account, “prosperous”, the family and their young sons soon adapted to life, with cricket being the principle outlet. Initially a talented leg-break bowler, Nassar stormed through the junior ranks at both county and national level. At the age of 12 he became the youngest player ever to represent Essex Under-15s, while upon reaching 15 he became captain of England schools. After enduring one of those spurts of growth so characteristic of his age, Hussain shot up and subsequently lost the trajectory and flight of his leg-spin. Although not considering himself a natural batsman, Hussain, spurred on by his father Joe, pushed himself, worked at his game and surmounted every obstacle to make himself probably the greatest “made” English batsman since Boycott himself. Even in his 2005 autobiography he confessed to never having found batting as natural a discipline as leg-break bowling. By 1993, then, after three years in international cricket’s Siberia, and at the age of 25, Hussain returned to the England fold. First under Gooch’s captaincy at the dawn of the series, and then under his exact contemporary, Atherton, Hussain played in four Tests, top scoring with 71 on his return to the team in the third Test at Trent Bridge. He batted at number seven for much of time, although Atherton nudged him up two places at the final Test at The Oval. Finishing the series with a duck Hussain had, once again, failed to convince the selectors of his quality. In four Tests he had averaged 30.66, giving him him an overall total of 284 from seven games at 25.82 at that juncture in his career. Missing out on a West Indies tour spot the following winter, Hussain had to wait yet another three years for his chance. When he did return, in 1996, aged 28, the thinning haired Nassar Hussain made a place in the England team his own. His return that year made him as an international cricketer. He launched his comeback with 128 against India at Edgbaston, followed by innings of 19, 36, 28 and an unbeaten 107 in the same series. When Pakistan came to town in the latter half of the summer Hussain contribued 48, 12 and 51. Moreover, following the Indian rubber Hussain had been made man of the series. Touring that winter, he picked up where he left off on home soil. In Zimbabwe, on an unhappy tour during which the phrase “flippin’ murdered ’em”, and the occupation “chicken farmer” became household terms, thanks respectively to David Lloyd and Eddo Brandes, Hussain hit a fine century in the opening Test in Bulawayo. Moving on to more tranquil waters in New Zealand, Nasser continued his resurgence. During 1998, in a full series with South Africa, and then Down Under in ’98/99 for the Ashes, Hussain further made up for lost time. A century at Lord’s against the South Africans and two more fifties, including a brilliant 94 at Headingley in the final Test, showed his nerve under pressure. Down Under the following winter in 1998/99, Hussain showed remarkable consistency in a team under fire. Scoring 407 runs at 45.22, his only “failures” came in the second Test at Perth. 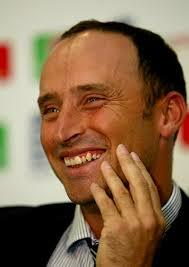 It was then in 1999, at the age of 31, that Nasser Hussain was granted English cricket’s top job. Succeeding Alec Stewart as captain, he took a team that was bottom of the international pile at the end of that home summer against New Zealand to third place in the world rankings. In all, he led the team in 45 Test matches up to 2003. By then 35, he relinquished first the one-day mantle, after the ill-fated 2003 World Cup campaign, and then the Test crown. Playing on under Michael Vaughan’s leadership until the 2004 English international summer, he bowed out in heroic fashion with 34 and and unbeaten 103 at Lord’s, where he struck the winning runs. In 96 Test matches he struck 5764 at an average of 37.18. With 14 centuries and 33 fifties. His masterpiece was without doubt the 207 against Australia at Edgbaston in 1997, described as being ” touched by genius” according to Wisden. Having made such a hard-fought ascent to the top, striving to a regular batting slot at 28 and then the captaincy at 31, Hussain demonstrated reserves of character and tenacity that we nowdays associate with a bygone age. The likes of Herbert Sutcliffe, Eddie Paynter, Kenny Barrington, Peter May and Geoff Boycott are all names synonymous with doggedness of character as much as with batting skill. Considering he needed three goes to make a success of it in Test cricket, he did well to play as many as 96 Tests. A classic case of someone making the most of his ability. That 200 apart, I can’t say I remember many of his 14 100s, but then so much Test cricket is played while most of us lesser mortals are at work – the evening highlights seldom do justice.